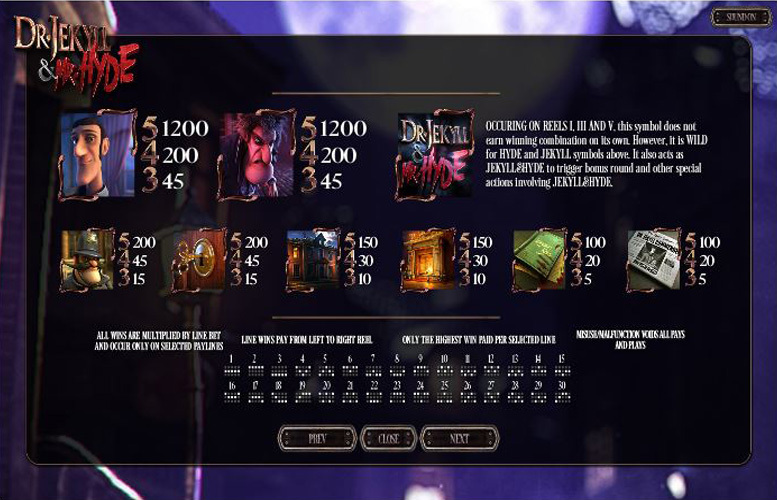 The Dr Jekyll and Mr Hyde slot machine by Betsoft is another highly atmospheric offering from a design team who are making a name for themselves for just that. The animation, artwork, and music are great throughout. Small touches like the stylised controls at the bottom add to the overall charm. One frustration with the lavish animation of Jekyll is the noises he makes wandering around the reels and “umming and arring” every five seconds. It gets tedious quickly. Fortunately, it can be muted without silencing the backing track. In terms of gameplay, Dr Jekyll and Mr Hyde doesn’t disappoint at all. There’s absolutely loads of great features that really add to the replay value. Quite frankly, it’s one of our favourite machines. You’ll see why when you trigger one of the bonuses! Looks incredible. As with many BetSoft games, the artwork and animation is exceptional. Great bonus features and loads of them. Low upper betting limit. Unfortunately, BetSoft don’t seem to make slots that cater for the highest rollers. Jekyll, or Hyde = 1,200x the line bet. Inspector or lock and key = 200x the line bet. Mansion or fireplace = 150x the line bet. Journal or newspaper = 100x the line bet. *Game lists max jackpot of 480,000 credits available to win from bonus features. When the Dr Jekyll symbol occurs on reel three, with the red potion symbol on reel two or four, directly adjacent, all Jekyll, Hyde, and Logo symbols become “wild Hydes”. The entire screen goes crazy (the animation here is great) and all the symbols swirl around into new positions. The new layout will award brand new winnings, including a special win for the wild Hydes! Similarly, when the Mr Hyde symbol occurs on reel three with the blue potion symbol on reel two or two, directly adjacent, players receive a special bonus of up to 20x their game bet. This random multiplier can result in some tasty bonus winnings! Players should also note that the “game logo” symbol can substitute Jekyll or Hyde to trigger either bonus. After any standard credit win, the “Double Up” feature button will become available. Players can opt to gamble their winnings on a simple coin toss game. Guess right and they’ll double their winnings. Guess wrong and the whole win is forfeited returning players to the main game. During paid games, a meter will be filled every time a red potion lands on the reels. When the potion meter is completely filled, free spins will begin. Each red potion that occurs on the reels during any spin equals one fill unit. 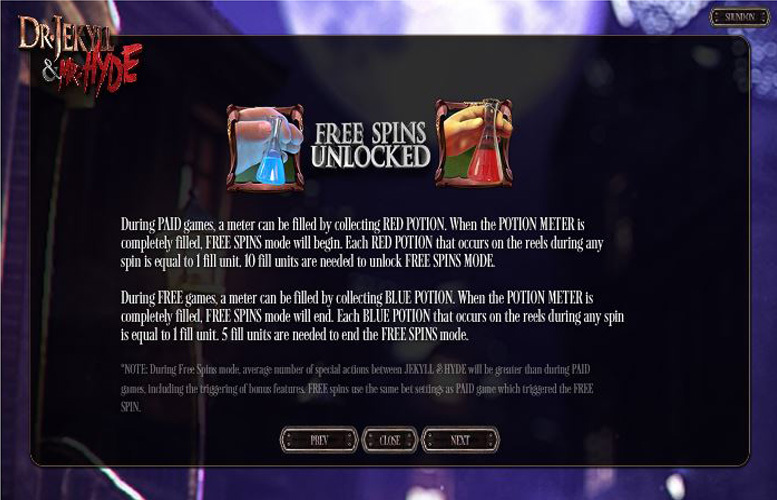 A total of ten fill units are needed to unlock the free spins mode. During these free games, a meter can be filled by collecting the blue potion symbols. When the potion meter is filled, free spins will end. Each blue potion that occurs on the reels during any spin is equal to fill unit. A total of five fill units are needed to end the free spin mode. Thanks to this dynamic, free spins can technically occur infinitely. BetSoft claim that during the free spin mode, the average number of special actions between Jekyll & Hyde will be greater than during paid games. These include the triggering of bonus features. When the Mr Hyde, game logo symbol, and Mr Hyde combination occurs across reels two, three and four, the Frenzy Bonus begins. We follow Mr Hyde as he marauds at night through the Streets of London. When he gets to a turn, players must choose left or right. On the way, Hyde must avoid the police officers and do as much looting as possible. There’s even the chance to earn up 66x the total game bet. However, players must beware of police officers. They’ll cost half of the total winnings awarded up to that point if they catch up to Hyde. When the Dr Jekyll, game logo symbol, and Dr Jekyll combination occurs across reels two, three, and four, the Potion Bonus begins. Players must select potion elements to craft the perfect “anti-monster serum”. The faster players can find the correct ingredients, the higher their prize will be. There’s an impressive 160x the game bet up for grabs too. 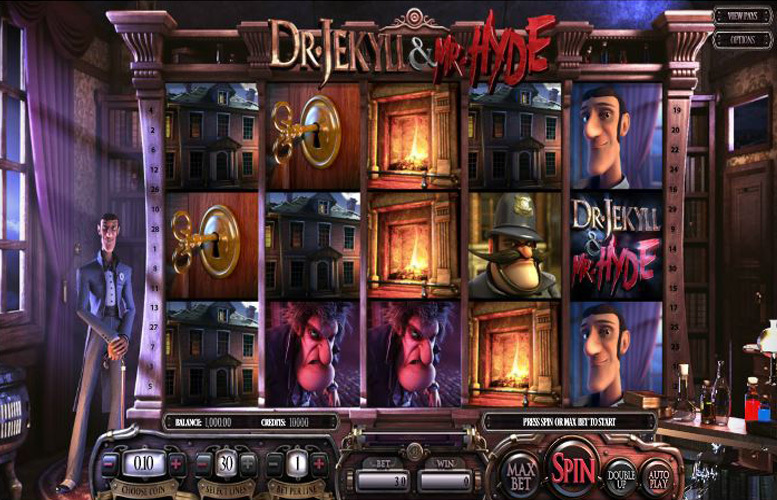 Players are given maximum control over how to distribute their bets on the Dr Jekyll and Mr Hyde slot machine. Firstly, they can adjust the value of each coin between 2p and £1. Next, the number of lines they bet on (one to 30) is variable. Finally, they can choose the amount coins bet per line. The lowest here is one and the highest is five. With all the values set to the minimum, the smallest bet per spin available is just 2p. Meanwhile, with all maxed out, the largest possible wager is £150. Like most BetSoft games, this one’s no good if your wanting to seriously splash the cash. Dr Jekyll and Mr Hyde is without doubt one of the strongest slots around currently. It looks and feels fantastic, and has the features to back up an almost perfect package. The only caveat is its poor upper betting limit. This is consistent with other BetSoft titles, and the company’s decision to limit games as such is long overdue a reversal. That said, Dr Jekyll and Mr Hyde is well deserving of its almost perfect score. This game has a rating of 5 / 5 with 694 total reviews by the users.